Improve your standard Magento thank you page by adding order summary, coupon codes for the next purchase, shopping recommendations, better order email and a lot more. Awesome Magento order confirmation page is a must-have for any store owner. Display full order summary on thank you page and new order confirmation email. Allow guests to register account and sign up for newsletter. Show product recommendations and offer customers discount for the next order. Both guest visitors and registered customers can print full order summary details. Allow guests to create an account on the "thank you for your order" page for easy access to order details, tracking information and other perks. Improve customer retention rate and sales by offering an unobtrusive way to create customer account. Both registered and guest customers can benefit from subscribing to your store newsletter before leaving the site. It’s a great way to offer special deals and promotions and convert your one time customers into returning shoppers. Display Related Products, Up-Sells, Cross-Sells or Recently Viewed Products in the product slider. Display personalized product recommendations on both the "Checkout Success Page" and the "Better Order Confirmation Email" to increase your average revenue per user. Display custom or auto-generated coupon codes on both the Checkout Success Page and the "Better Order Confirmation" Email. Admin can change the design, promo messages and specify customer groups that should get special discount codes towards their next purchase. Admin can enable a new order confirmation email to replace the basic Magento 2 transactional email template. Better order confirmation email template includes many features from the Checkout Success Page, such as: full order summary with product pictures, shipping details and order subtotal, discount codes towards next order, recommended products and social media banners. The Facebook Business Fan Page section allows you to promote your company's Facebook page. Allow your customers to share their shopping experience with friends after the order is placed. The more people can hear about your store, the better. Enable or disable all 10+ sections on the checkout success page from backend, modify link style and button colors to match your unique design. This highly customizable Magento checkout success page module was designed to make a "Thank you" page more informative and user-friendly. Each and every element, can be configured to match your specific website design. Multiple features, such as the ability to share order experience via social networks, award customers with auto-generated discount codes, display cross-sells, up-sells, related products, advertise your other deals via 2 CMS blocks, are available for your convenience - and a lot more. In combination, all these features make the Magento order confirmation page by Plumrocket Inc. a really must-have extension. The standard checkout success page is very simple and shows a very few information. Customizing the checkout page is expensive but the Checkout Success Page Magento Extension by Plumrocket really rocks and gives you many options to customize your checkout success page. It helps to boost your sales and also give useful information to customer just after the successful checkout. Great extension. It works as described and looks very nice. Thank you! I highly recommend it! Installation and configuration process is very simple. Thank you plumrocket for providing us a wonderful extension it makes custom engage with you with their social share etc. I looking your one step checkout extension for Magento 2 because I found your company one of the best customer experience based company. when you launch please update us on email. Excellent extension with lot of features. With this extension, customers can see next order coupon, facebook page like page request & product recommendations in checkout success page. Also it comes with best order email template. Customer support team is also good. Best and easy to install. This is my first ever extension I am getting from Plumrocket. I really love how their extensions easily integrate to our magento theme with little to no issues. The extension is great and full of awesome features like better email, related products, sharing the order detail, promotions on success page.... It does what it is supposed to do and very easy to install and configure. The support is also good when you have questions. I had to translate mine to dutch and they assisted me very well in this process. I would totally recommend to buy this one. Does everything it says and then some! Great extension to customize your success page and offer more features and social media sharing. Order confirmation pages now look more robust and not so plain. The support team has been quick to respond and super helpful as well! Very Nice Checkout Success Extension. We used it in magento 1.9 and now using in magento 2 without any bug or issue. Thanks team! Looking for other extensions too. The exit letter comes beautifully and tidy. There's a discount code in order to encourage back again. 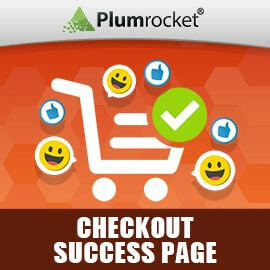 The Plumrocket Checkout Success Page Extension works really well. I had some issues with installation and the Plumrocket support was fast and courteous. I like how there is lots of options plus the added ability to print directly from the checkout success page is great. This extension provided us with comprehensive options to choose from for to suit ones needs and requirements for our Payment Success Page confirmation with many configurable options available which was easy to set up. We are using this add-on on several websites and this is so far the best one we have. Customer can see the details of his order and we can add some information for the next order. We were looking for a improving our consumer experience in our checkout process, that worked seamlessly with our custom theme. Plumrocket Extension and their team were able to make the needed changes, and customize our points messaging as part of the checkout process. We appreciate the professionalism and attention to detail the Technical and Support team has shown thru this experience and would definitely leverage the team as a GoTo organization for our future needs. This extension has added significant value and functionality to my success page. Great support too from the Sales and Tech teams. Why send buyers to just a "Thank You" page when you can encourage them to come back using discount codes, Facebook likes, and other further discounts? Great idea for added sales and excellent support. I looked for a similar extension a lot until I found this one. Easy to install. Configuration is done very quickly. My clients enjoy this extension. Interconnect with other Plumrocket extensions (Facebook like, Reward points, social share). I like the customer registration possibility on success page. A great extension I would recommend it! I like the page is designed. Giving a nice summary for the customer and very good way to offer incentives for next orders. This extension is a good way to offer confidence in your store to your first time customers. This extension worked out of the box. Clean code beautiful design that seamlessly merged with my over eCommerce design. most important great user experience after checkout.... love it. Great application, great customer services! Easy extension and very customizable. I like it! It very simple to configure it. This is the best checkout success extension! I recommend this extension to anyone. Great application! I will definitely recommend and buy the other modules. Very easy to use a nice module. Integration was easy and flawless. 10/10 would buy again. But i was missing the Multilanguage Factor for the Facebook Banner (Image) for each StoreView. This extension is awesome. I thought i might have to do a lot of configuration but it was super easy. Very few things need to be changed and is extremely well thought out. The UI elements are well thought out and I'm already getting more FB likes because of the way this extension works. I've noticed my clients were going back to our store to view the order details after order was created. With this extension client doesn't have to go back to our site. We are getting more likes on Facebook because of this extension. It could be more customizable (moving sections up-down and left-right). I moved to magento 2 early and there weren't that many extensions available but of the ones that I tested this is definitely the best. Support is great, installation and configuration was easy. I really like the Design of the Checkout Page and the email order confirmation is awesome. A really nice extension if you care about the design and the customer's satisfaction. New Checkout Success Page make your site greater! This extension has been installed on my Magento 2 store. Its very simple to configure it and make different page layout the way I want. Lots of thanks to the professional and courteous team. They developed a wonderful module. We really appreciate their support. Thank you Plumrocket team! Definite improvement and great support! This is a great extension built for those of us that don't have time or experience to create our own custom page. I think this extension is worth the money for the customized and personal appearance you can give to your website, but even more importantly because of the support. I've purchased many modules and extensions from various developers and have been frustrated by the lack of support and in some cases stupid and incoherent comments that don't make sense in the English language. Plumrocket is by far one of the best companies that I've dealt with. It is wonderful for customer to see this beautiful page after purchase. It improve customer experience which become different to competitor. It also easy customizable. Inititially had a problem after installing (turns out due to another module conflict) but customer support dealt with it fast and professionally. Wanted to do some text alteration on Checkout Success page and again customer support not only advised files to amend but sent DETAILED instructions and screencasts to actually show step by step what to do! I wish all developers were as professional and helpful in their support as these guys. This is an extension I would definately recommend to anyone that wants to make their store stand out & customer friendly as well as having the best support I have come across from a Magento developer. We chose this extension and everything worked smoothly but the email confirmation of customer registration wasn't sent on checkout success page. Their support helped resolve it really quickly and we had the extension running in on time. This is really good module. Works gooed. Too bad it is not a bit more flexible (in the sense that I could change the sequence of the different parts of the success page.). It also changes your email layout, even if you choose to disable the function "better email". Which might mean that you loose some modifications of 3rd parties that you made to your email templates. Thank you for your review and suggestions. We plan to add an ability to change the sequence of Magento Checkout Success Page Extension blocks in the future versions of the extension. Regarding conflict between "Better Order Email" templates and custom email templates - it has been solved in Magento Checkout Success Page Extension v 1.1.4. which is available now to download. Very customizable extension. The new account creation on thank you page functionality is awesome. I can say that it increased my new account creation with more than 25%. Thank you for a very good and customizable plugin! This extension is simply great! I loved this extension, it worked instantly in our magento store! the best of it is Plumrocket support, they are awesome. One thing about this extension is that is doesn´t show the actual footer of the website, I would love to have the same footer of every page. Thanks! Another one of those areas that is lacking in a standard magento install is the checkout success page, we looked for a while at having ours improved. Finally found plum rocket and they whipped this up for us. The page now looks great, has excellent features and is easy to use. Simple to integrate and upgrade the magento success page. Love the ability to add coupons and promo codes for your next order.